If you’ve been interested in fitness and health for more than a minute, then you know by now how important drinking plenty of water is for getting your body into top shape. But do you drink enough water? And is it really going to impact your results? Your body is made up of 60% water, which is incredible when you stop and really think about this fact. All day long you are constantly losing water by sweating and going to the bathroom – and this water must be replenished to keep your body in a healthy, working order. Many health authorities believe in the 8x8 theory: drink 8 (8oz) glasses of water throughout the day, or roughly 2 litres. However, a growing sector of fitness and health professionals are speaking out against this theory, stating that it is simply too little to keep you properly hydrated. Those behind the movement to drink more than 2 litres per day are stating that the only way to truly stay hydrated is by sipping on water constantly throughout the day, and by making the effort to drink water even when you don’t feel the signs of thirst. Studies have being released showing, that drinking more water throughout the day leads to better brain functioning, fewer headaches and physical performance. When you are operating in a state of mild dehydration you will experience diminished brain functioning, more frequent headaches and a decline in physical performance. Does More Water = More Fat Loss? 1. 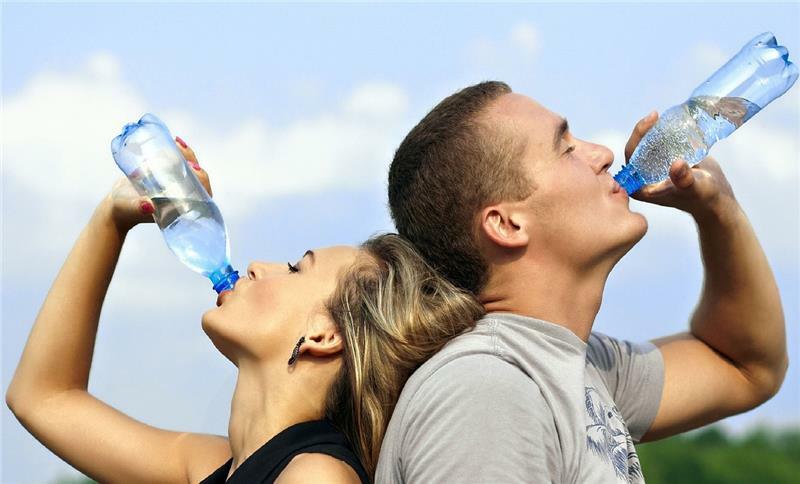 An increase in metabolism: Studies show that drinking water temporarily boosts metabolism for an hour or so. This means more calories burned, and more pounds lost. 2. A reduction in appetite: Staying properly hydrated helps to reduce dehydration signs that are often mistaken for hunger. It is also a viable strategy to drink a full glass of water immediately before a meal to reduce the calorie intake of that meal, leading to lower overall calorie intake for the day. It’s clear that drinking water throughout the day is an important part of being healthy and reaching your fitness goals. One of the best ways to make sure that you meet your hydration goals is to keep a large water bottle with you at all times, and to refill it every time that it is empty.